The group calls itself "Cheollima Civil Defense" and "Free Joseon" and claims it's the legitimate government-in-exile of the Democratic People's Republic of Korea (DPRK). However, while it said in a Tuesday statement it "responded to an urgent situation in the Madrid embassy" last month, it denies it was an attack, saying, "We were invited." "[C]ontrary to reports, no one was gagged or beaten," the statement continues. "Out of respect for the host nation of Spain, no weapons were used." 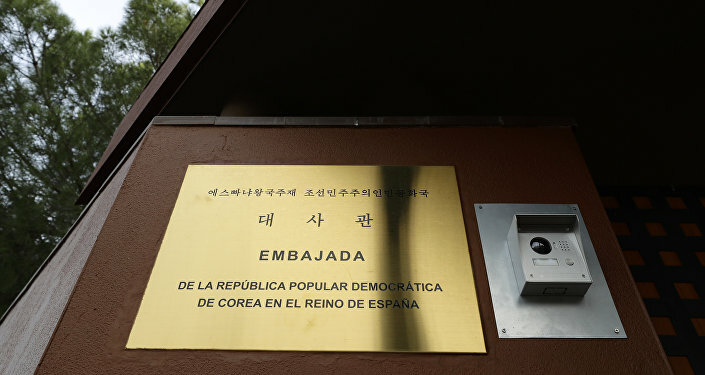 Previous reports by El Pais said the assailants had handcuffed embassy employees and beaten them while trying to intimidate several diplomats to divulge information to them. This is the first time any group has claimed responsibility for the February 22 incident, which some had speculated to be either a US or South Korean operation. However, Cheollima Civil Defense says "no other governments [were] involved with or aware of our activity until after the event." That said, Cheollima Civil Defense's statement seems to corroborate claims by the Spanish High Court, the website NK News noted, including that the group responsible stole hard drives, flash drives and computers from the embassy and tried to sell them to the American FBI. The Cheollima Civil Defense statement said they had "shared certain information of enormous potential value with the FBI in the United States, under mutually agreed terms of confidentiality," lamenting, "This information was shared voluntarily and on their request, not our own. Those terms appear to have been broken." However, the US government "had nothing to do with this," remarked US State Department spokesperson Robert Palladino on Tuesday. The Spanish National Court issued a statement Tuesday saying the group had acted on its own initiative and confirming that the group's leader had traveled to the US to speak with the FBI. NK News notes the group was formed in March 2017 following the death of North Korean leader Kim Jong Un's half-brother, Kim Jong Nam, and claims to be the protector of numerous high-ranking North Koreans who have defected to the West. It seems to have claimed responsibility for numerous other incidents, too, such as vandalism to the DPRK's Malaysian embassy in Kuala Lumpur. Pyongyang hasn't responded to the Cheollima Civil Defense statement.